A huge thank you- a truly fantastic and inspirational talk. Leon's presentation on Leadership at the 2014 Young Leaders NI Conference was nothing short of inspirational and the feedback from event attendees has been fantastic. Leon's delivery style is captivating and he had the delegates in the palm of his hands. A real life adventurer with unrivalled experiences to share...get booking! I had the great pleasure of chairing Leon McCarron's lecture to the Society yesterday evening. His vibrant, enthusiastic presentation and crisp photographs enlivened further the evening's event, already enthralling. The audience were generous in their applause and there were more questions than there was time for. An inspirational talk. Very well presented and the message: BRILLIANT! I would have no hesitation in recommending Leon's talks in any sector or line of business. Leon is a passionate storyteller and a firm believer in the power of an adventurous mindset as a key element of fulfilment and success. He brings the audience on a journey with him; along the frozen banks of the Yellow River on foot, over the high passes of the Rocky Mountains by bike, or through the searing heat of the Empty Quarter desert with a 300kg cart in tow. Leon relates the lessons he has learned from these expeditions to everyday, real-life challenges. 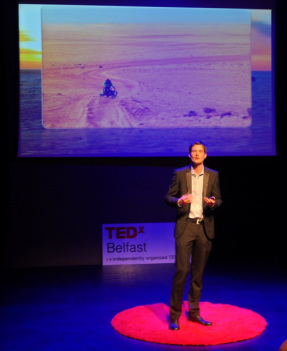 Adventure is not just trekking across China or navigating through a subzero blizzard – adventure is all around us, everyday, and in his talks Leon explains the benefits of recognising and embracing this concept. Leon has presented to thousands of people around the world at a variety of events - from business seminars to school groups, from cycling clubs to cruise ships, from a keynote address to an after-dinner function - Leon can tailor his talk to the needs of the client. Click on the button below to enquire. He is witty and urbane, and modest enough to make his feats seem quite normal. But audiences are impressed by the strength of his will and his willingness and ability to live near the extremes of human endeavour. We booked Leon McCarron to speak to press at an event at the National Geographic Store...following the inspiring presentation, Leon spent time with press who conducted one to one interviews. The talk was interesting and the press enjoyed the interviews with Leon too. We would recommend Leon, he was professional throughout. Leon's presentation on Leadership at the 2014 Young Leaders NI Conference was nothing short of inspirational and the feedback from event attendees has been fantastic. Leon's delivery style is captivating and he had the delegates in the palm of his hands. His ability to use his experiences to support his "10 key traits of an effective leader" was genius and the visual images used were often breath taking. A real life adventurer with unrivaled experiences to share - these are tales you simply must hear - get booking! ﻿Leon's humorous narrating of his fascinating trips all over the world entertained everybody, and how he spoke of his early post-university life, traveling inexperience and naivety made him relatable to all. I don't think there was one person out of 150 in the room who wasn't thinking "what can I do myself, that's unique and adventurous and maybe a bit crazy but absolutely amazing?". That is exactly the sort of inspiration we were hoping for, and Leon was a great speaker in his delivery. Leon spoke at our recent conference and inspired us all to view our own lives as a journey... and as an adventure. His top tips resonate across a variety of fields of work. He had the audience absolutely hooked – we could have listened to him all day! Leon's presentation to Sport Northern Ireland's "Active Communities" network of coaches ticked all the boxes - provided a compelling insight into how participation in physical activity can change lives (for the good) and inspired the coaches to believe that with passion, determination and a large dose of resourcefulness, anything is possible. We've had nothing but positive comments back from all the delegates at the conference. Leon was a stand out speaker from our event. He came across as a warm and interesting person, who was both polished and professional. The slides which accompanied his talk complimented the narrative brilliantly. We feel he would captivate a wide range of audiences with his tale of walking from Mongolia to Hong Kong, and he is extremely comfortable in front of an audience. Feedback from members of the audience was extremely positive and many said they felt inspired following his lecture. I had the great pleasure of chairing Leon McCarron's lecture to the Society yesterday evening. His vibrant, enthusiastic presentation and crisp photographs enlivened further the evening's event, already enthralling given the geographical story he had to tell of walking from the north of the Gobi Desert to the South China Sea. The audience were generous in their applause and there were more questions than there was time for. ﻿NI has had its fair share of legends but this chap is up there! The Duke of Edinburgh’s Award were thrilled to have Leon McCarron present Gold Awards on behalf of HRH the Duke of Edinburgh at St James’s Palace. He was very engaging and we enjoyed his humorous tales of his many adventures. We look forward to having Leon back! A massive thank you to Leon for yesterday’s event! It was truly inspiring and everyone really enjoyed it. Leon’s thoughtful and beautifully illustrated talk about his journey through the Holy Land was a wonderful start to our 29th season. It was great to have someone reassert the humanity, hospitality and generosity of spirit of the people who live in this beautiful part of the world. Leon held us captivated with stories of his adventures conjouring up some brilliant mental pictures. Humerous, at times scary and thoroughly down to earth, Leon's presentation cannot fail to put a smile on your face and an adventurous spirit in your heart. ﻿I invited Leon to Prague with his two lectures about crossing the Empty Quarter and travelling along the Longest Iran River. In the Czech Republic this type of adventure has never been presented before, so for everybody it was fantastic to hear such great stories. In this modern world I suggest that everybody should hear Leon's tales and experience his infectious, adventurous lifestyle. Leon is an engaging speaker. He has a real passion for adventure and the ability to infect the audience with his enthusiasm. Leon has spoken for Explorers Connect more than once and will always be welcome back - we can't wait to see what he gets up to next! Leon enlightened us on the subject of Wonder in his ShedTalk, as he described his extraordinary man-powered adventures across the globe. Eloquent, witty and engaging, Leon approached the talk and the audience with the practised exuberance only a seasoned speaker possesses, sure in the knowledge that his wealth of hilarious stories, curious experiences and unique view of the world would engage and entertain in equal measure. He didn’t disappoint. We booked Leon to talk at one of adventure evenings in our Covent Garden store, and Leon gave a genuinely inspirational talk with the perfect balance of tales of adventure and humorous stories. Following the evening we have received great feedback from our customers and it is apparent that Leon certainly engaged the audience! Leon is an inspirational adventurer with some amazing stories to tell! It was our pleasure to have Leon give a presentation at one of our Clubs monthly meetings. All present found the presentation to be very rewarding and thought provoking and it certainly caused a lot of discussion in the Club room afterwards. We will be trying to arrange a return visit as soon as possible. ﻿What an extraordinary journey - with the day-by-day route discovery aspect, setting it apart as what I call and categorize as - real adventure! I enjoyed the variety of information and surrounding issues that you fed into your presentation, and still managing the 4000mph coverage to arrive at HK in 40 minutes! Very many thanks for joining us to share your trans-China walk.